Initially supported by a grant from the Heritage Lottery Fund and now mainstream funding from Newport City Council, the Welsh Government and the Friends of the Newport Ship, the project continues through the conservation stage at the Medieval Ship Centre ship where the timbers and the artefacts discovered during the excavation are being held prior to and following freeze-drying at York Archaeological Trust. This work is still uncovering new and exciting information about the ship. A coin was found placed between the keel and the stem post. The positioning of this coin is such that it can only have been placed there during the very beginning of the ship construction. The low value silver coin is a petit blanc of the southern French state of Dauphiné (near modern day Lyon). The coin was minted in the summer of 1447 and thus, the ship must have been constructed at some point after that date. We now know that the Ship is of Basque origin, was large for its time being some 35m long and over 8.5m beam. The timbers have been dated to 1449. The timbers have all been reverse-engineered to produce 3D laser printed parts at 1/10th scale which have been reassembled to show exactly what the hull looked like. The ship spent the majority of its trading life between Bristol and southern Portugal and was brought to Newport for repair after 1468 and abandoned there. 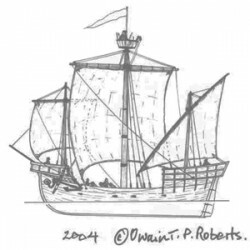 Medieval Ship developments can be followed on Facebook (opens new website) and on Twitter. The Medieval Ship Centre is open on a regular basis, currently every Friday, Saturday and bank holiday Monday from Easter until October (see the web site for details). Group visits can be accommodated given due notice; please contact the chairman for more details.